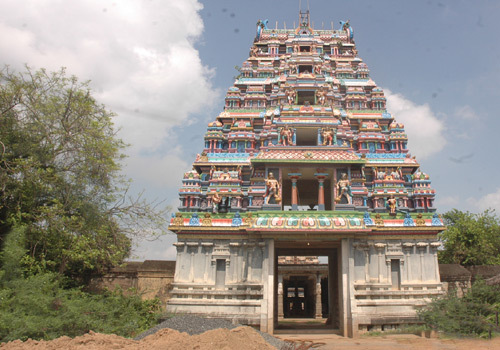 Sri Uthirapasupatheeswarar Temple, Tiruchengattankudi, Tiruvarur Dist. +91- 4366 - 270 278, 292 300, +91-94431 13025. It is noteworthy that 8 Samharamurthys are in line in the prakara – Lords Bhujangalinga Murthy, Gaja Samharamurthy, Oordhva Thandavar, Kaala Samharamurthy, Gangalamurthy, Bikshadana, Tripura Samharamurthy and Bhairava. 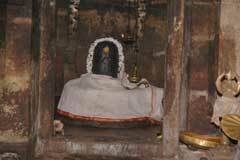 Their presence in a single temple thus facilitates darshan of all Samharamurthys of Ashtaveera sthalas-temples in various places. Lord Subramanya with His consorts Valli and Deivanai blesses from a shrine sitting on a demon peacock. 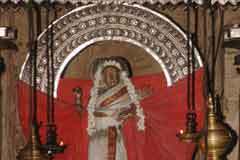 Saint Arunagiriar had sung the glory of Muruga in his celebrated Tirupugazh hymns. Mother Durga blesses from the goshta of Shiva shrine with eight hands holding weapons, one of which is a bow, a different form in this temple. There is a sculpture in the temple showing Saint Siru Thondar being taken to Mount Kailash. Lords Arthanareeswara, Brahmma, four Saivite Saints praised as Naalvar, Nagar with Sanganidhi and Padmanidhi and Twin Bhairavas have their shrines in the prakara. 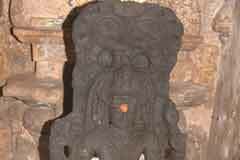 Sun God-Surya is alone in the Navagraha-nine planets mandap on a high seat. 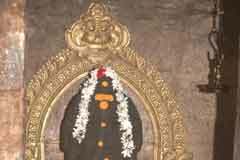 Lord Uthara Pasupatheeswarar adores the temple from a shrine having its own Vimana right of the presiding deity Ganapatheeswarar. He enjoys all priority in the temple. The place also is named after Him. He is holding Udukkai, Trident and the Tiruvodu the begging bowl. The temple and the place occupy a place of importance in Saivism history. 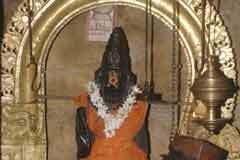 This is the birth place of Paranjothi, a staunch Shiva devotee and Chief of the Pallava army. He was always a winner and lost no battle as he was backed by the blessings of Lord Shiva. The king thought that if anything unnatural occurred to his commander, it would be a wrong committed against Lord Shiva and therefore, granted retirement to him from services to continue a choice life dedicated to the service of Lord. Paranjothi-later Siruthondar-was too happy that he would be able to turn all his attention to a life of spirituality. He was married to Mangai Nallal mentioned as Tiruvenkattu Nangai in our Saivite scriptures and a son named Seeralan. The couple was very particular to have their food only after hosting a lunch to Shiva devotees. They served what devotees wished. One day none turned up. Siruthondar left the house in search of a devotee. When he was out, a Shiva devotee knocked at his house. Tiruvenkattu Nangai and her maid Seerala Nangai welcomed the devotee and invited for the lunch. The devotee said that he would not accept the invitation when the male head of the house was absent and that he would wait near the Kattathi tree at the temple. When Sirthondar returned he was happy to hear that a Shiva devotee was waiting at the temple. He rushed to meet him and extended his invitation. The Shiva devotee said that he would dine with him only if Siruthondar slaughtered his only son, cook and serve him the meat. Siruthondar had no hesitation to accept the condition. He and his wife prepared the food with their son’s meat as wished by the devotee. When food was served, the Shiva devotee asked the host to call his son also to join him. Shocked and surprised, the couple came out and cried Seerala, Seerala. The boy in all flesh and blood came alive before them. When they entered, the Devotee in His true Form granted darshan with Mother Parvathi and salvation to all of the four including the maid. He was Lord Pasupatheeswara. 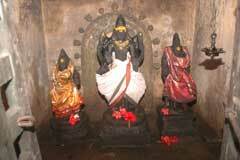 The Kattathi tree and a shrine of the family of Siruthondar are just before the Shrine of Lord. A king ruling this region then had no children. He prayed to Lord Shiva for child boon. While he set out for hunting once, he found four beautiful female children, brought them up as his own daughters in the place. When they attained the marriageable age, he begged Lord Shiva to marry them which Lord obliged. 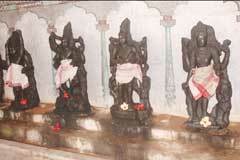 They are the four Ambicas’s in four temple as Vaaitha Tirukuzhal Nayaki in this temple, Karundhar Kuzhali Ammai in Tirupugalur, Sarivar Kuzhali in Ganapatheeswaram and Vandar Kuzhali in Tirumarugal. They also bear the common name Shoolikambal as they took care of a poor women during her labour time and helped safe delivery. Shool in Tamil mean pregnancy. Hence the name Shoolikambal. 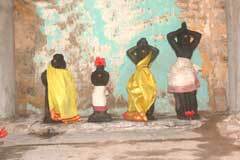 As Ambicas returned late at night after attending the pregnant woman, they did not enter the temple and waited outside. Hence, their shrines also are outside the temple. During the Arthajama Puja (final night puja), a nivedhana made of Samba rice, pepper, Seeragam, salt and ghee (given to mothers after delivery of the child) is offered to Ambicas. Vinayaka worship came in to Tamilnadu with the arrival of Vadhaba Ganapathi from north. During a war, Paranjothi saw this Vinayaka, worshipped Him, won the war and brought the idol here as his Winner Cup. He installed the Lord in this place, where Vinayaka earlier got relieved from the dosha for killing demon Gaja Mukha Asura. Vinayaka idol worship began from this event only, it is said. Hence, He is praised as Aadhi Vinayaka. He is in a sitting form folding both legs. Special pujas are performed to Him on Chaturthi days-fourth day of full or new moon. It is also believed that Lord Shiva granted relief to Vinayaka earlier here from His dosha on a Sadaya star day in Margazhi (December-January) month. Special pujas are performed on this day with Lord Vinayaka procession. A king wanted to make an idol for Shiva depicting His darshan to Siruthondar. But the idol was not perfect despite several attempts. A Shiva devotee came there and asked for water. The frustrated sculptors offered the melting metal mixture to him. The devotee drank it and became a perfect idol. There was a small projection due to excess metal on the forehead. When the sculptors attempted to correct it by removing the excess metal, it began to bleed. They immediately applied saffron and borneol (pachai karpooram) to stop the bleedings. The scar on Lord Uthira Pasupatheeswarar is still visible. During the evening pujas saffron and borneol are used. Abishek are performed to Lord Uthira Pasupatheeswarar on the Tamil monthly days of Chithirai-April-May, Aadi-July-August, Aipasi-October-November, Thai-January-February, Chithirai Bharani star day-April-May, Vaikasi Thiruvonam star day in May-June and Aipasi Bharani star day in October-November. 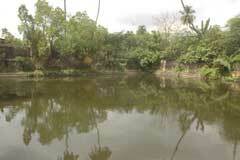 As the blood of demon Gajamukhasura flowed as a river when he was destroyed, the place is called Tiru Chengattan Kudi in Tamil and Raktharanya Kshetra in Sanskrit.